The country’s historic heartland, known as the ‘Cultural Triangle’, contains a mind-numbing array of ancient sites with impossible-sounding names: Anuradhapura and Polonnaruwa, respectively capitals from the 3rd century BC and the 11th century AD, Mihintale, a sacred monastic center of caves and temple ruins; the great cave complex of Dambulla, housing hundreds of Buddha images, its walls coated with 16th-century paintings; and the extraordinary rock palace of Sigiriya. 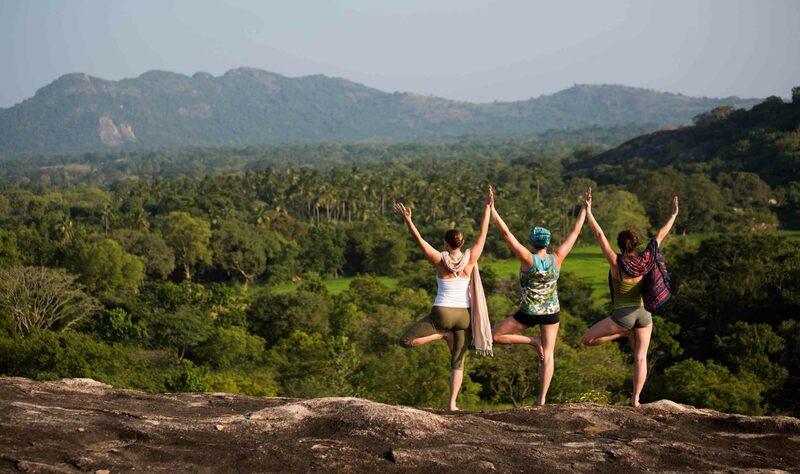 Other, less visited places range from the monumental Aukana Buddha, a vast statue hewn out of solid rock face purportedly in the 5th century, to the royal hunting fortress of Ritigala, so hidden in dense forest that it remains semi-secret. It would require superhuman effort to take in more than a few of these shrines, palaces and monuments; and besides, in the sapping heat the density of history and legend becomes bewildering – which makes relaxing accommodation all the more desirable. Over on the western fringes of the Cultural Triangle, Ulpotha offers perhaps the ultimate blend of relaxation and ecological commitment. This hidden haven is not designed to appeal to everyone, but those seeking tranquility tend to get hooked – when I was there one guest was on her third visit from Britain in less than a year. It is a working village rather than hotel, whose community was founded on an abandoned coconut plantation in the mid-1990’s. Its mission was to develop the surrounding farmland so as to revive traditional agricultural practices for the benefit of both the land and the people. Since 1997 paying guests have been welcomed for the part of the year, helping to fund the non-profit-making operation. The lifestyle is basic: there is no electricity, hot running water or alcohol (unless you take your own). This may sound absurdly ascetic, particularly give that a holiday here does not come cheap by local standards. Yet Ulpotha is far from being a boot camp. Traditional accommodation has been adapted for considerable comfort. The open-sided mud-hut bedrooms are beautifully and simply furnished with local fabrics, rush mats and pottery. Each grouping of three huts shares a stylish bathroom area complete with wooden-seated flush loos and outdoor showers where, in the heat, the water is naturally tepid. And the lack of electricity seems a bonus in the soft, lamp-lit evenings. There are no waiters or maids, yet the discreetly attentive hospitality of the villagers during my stay rivaled the best service offered by Sri Lanka’s formal hotels. In a health-farm-meets-house-party atmosphere, meals are nutritious, vegetarian feasts served communally to guests (the maximum capacity is 19) in a central pavilion. Yoga, mainly led by teachers from London, is the chief attraction for most visitors, although there is no pressure to join the classes. Reading, snoozing in hammocks, swimming in the reservoir, visiting the local temple, and receiving massage and Ayurvedic treatments are the other principal entertainments.